At Lowe’s Construction, LLC, we are expert New Orleans deck building contractors. With years of design and building experience, our team of deck builders can create a beautiful and sturdy deck for your outdoor pleasure. From custom deck designs to standard deck plans, our New Orleans deck builders have the skills and experience to ensure your outdoor living space is beautiful, functional and enjoyable. Decks can be useful in transforming exteriors areas after a home elevation. Custom decks are a practical and functional decorative addition that can break the monotony of your existing landscape. Building a deck for the upper floors of your home can be very attractive and useful for those who are living there. Such decks are perfect for using as observation areas, letting your eyes feast on the beautiful scenery surrounding your home in the New Orleans area. 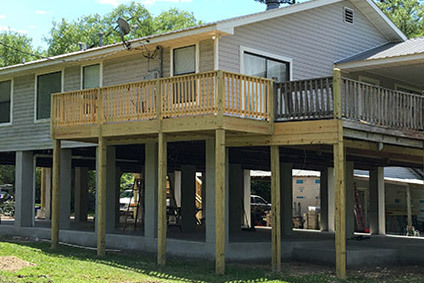 Our New Orleans deck building experts will help you choose a custom deck that will easily and beautifully mix with the existing theme, color scheme, and landscape of your home. We only use quality building materials and wood to ensure long lasting enjoyment of your new deck. Our goal is to give you a beautiful custom-built deck that you and your family can enjoy for years to come.